Australia’s largest Marxist-Leninist organisation is attempting to radicalise that nation's Muslim communities. Democratic Socialist Perspectiv, the latest incarnation of the formerly Trotskyite Socialist Workers Party, is using its front group Socialist Alliance and its newspaper Green Left Weekly to propagandise among Arabic speaking Australians. Links goes on to makes it clear, that revolution, not community service is the goal of the Flame project. "Iskander and his team are working to involve progressive activists from other Arabic-speaking communities in the Flame project. They are promoting GLW subscriptions to interested members of the Arabic-speaking communities. GLW is proud to be taking this major step to broaden the audience for progressive ideas and news of the movements for radical political, economic and environmental change. We know we will not achieve radical change without bringing together all sections of the oppressed and exploited in a common struggle". 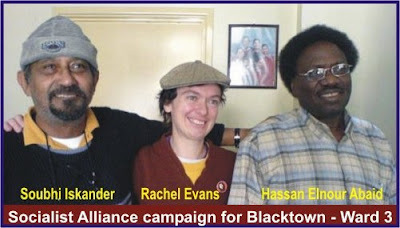 In September this year Soubhi Iskander and fellow Sudanese Hassan El Nour Abaid stood unsuccessfully for Blacktown City Council on the Socialist Alliance ticket with gay rights activist and DSP member Rachel Evans. Iskander has been co-editor of the Arabic newspaper Akbar Misr (Egypt News) since 1996 and serves on the management committee of the All-Sudanese Council. Before coming to Australia, Iskander was a veteran of the Sudanese Communist Party, joining in1956, two years after the party’s founding. Arrested and tortured several times for his communist activities, Iskander eventually secured a passport by bribing police and came to Australia in 1994 as a political refugee. In 1996 Iskander helped establish the Sudanese Australia Human Rights Association “to advocate for people who are persecuted in Sudan and make the Australian people aware of what is happening there… We tried to defend Sudanese people in Australia against any form of racism…We came to the conclusion that there is racism in Australia, even though people say that that is only in the past". Human Rights Association and is involved in several other Sudanese organisations. Abaid previously lived in Cairo and in Libya where he helped form the Democratic Alliance-an opposition group of several Sudanese political factions, including the Communist Party.